St. Lawrence Seaway near Montreal, QC, May 2 2008. The vessel Voyageur Pioneer has truly had a colorful career, both in hull colors and trade routes. Her original owners, James Richardson & Sons through their division, Pioneer Shipping Ltd., were dedicated to grain transportation on the Great Lakes. The vessels of Pioneer Shipping were under management of Misener Steamship, and in 1983, when Misener decided to construct two dual-purpose “Salty-Lakers”, Pioneer decided to build one of their own of the same design. The keel was laid September 29, 1982 as designated hull # 258 at Govan Shipyards, Glasgow, Scotland, the bulker being launched July 13, 1983. The Saskatchewan Pioneer differed from the previous two sisters as she bore the yellow/orange Pioneer hull colors. The three “Salty-Lakers” were to be managed by Misener Transportation for service in the grain/ore trades during the Great Lakes shipping season and switch to deep-sea operations in the 3 month off-season. Misener’s management of the Pioneer Shipping vessels included booking cargoes, hiring crews, negotiations, servicing, accounting and maintenance. The three Scottish built bulkers were unique, for at this time “Salty-Lakers” was dominated by self-unloading vessels, namely, Halifax, Algoport, Nanticoke, Sauniere, Algobay, Atlantic Superior, Atlantic Huron, Atlantic Erie, Canadian Pioneer and Canadian Ambassador. The name Saskatchewan Pioneer recognized the longtime association of the James Richardson & Sons Companies and the development of the western Canada grain industry. Upon launch and delivery of the ship nicknamed “Sask Pi”, the owner, James Richardson & Sons marked the 100th anniversary of the first shipment of grain overseas via the Great Lakes. Each of the three Scottish built Salty-Lakers was built with private air-conditioned rooms. The vessel is powered by a single Sulzer model 4RLB76 two stroke cycle, single acting 4 cylinder 10,880 b.h.p. (8,098 kW) diesel engine burning intermediate grade fuel oil; the power being fed to a single controllable pitch propeller in a Kort nozzle giving the vessel a rated service speed of 13.8 m.p.h. She is equipped with a 1,240 h.p. (923 kW) KaMeWa bow thruster. Seven hatches equipped with McGregor hydraulic hatch covers with automated cleating service 7 holds where the vessel is capable of carrying 33,824 tons (34,367 mt) at her maximum draft of 32’ 08” (9.962m) and 25,875 tons (26,291 mt) at the Seaway draft of 26’06” (8.08m). To maximize the ocean capacity, the ships are built to a 48’ (14.63m) depth, sacrificing 8% of available cargo tonnage to comparable 730’ (222.5m) dedicated lakers in order to gain year round cargo flexibility. Cubic hold capacities include 39,500 net tons of coal (standard measurement for coal, equivalent to 35,268 tons or 35,834 mt)*, 35,195 (35,760 mt)* of wheat, 33,203 tons (33,736 mt) of corn or rye, 29,125 tons (29,593 mt) of barley and 26,776 tons (27,206 mt) of oats.Other capacities include 1,363 tons (1,383.5 mt) of intermediate fuel oil and 124 tons (126 mt) of diesel oil. The vessel’s hull was built to Lloyd’s 100 A1, Ice Class 3 classifications and strengthened for heavy cargoes (with holds 2, 4, & 6 or 1, 4, & 7 remaining empty). On her delivery trip in the fall of 1983, she was first of the Misener Salty-Lakers to experience heavy North Atlantic weather. Upon arrival in Thunder Bay, ON on October 12, 1983 she was opened for public tours. She began her ocean trades on November 14, 1983, with grain loaded at Duluth, MN for Le Havre, France. On February 15, 1984 she loaded grain at Baie Comeau, QC for United Kingdom. Following this trip, she returned to the Great Lakes trades for the 1984 season. 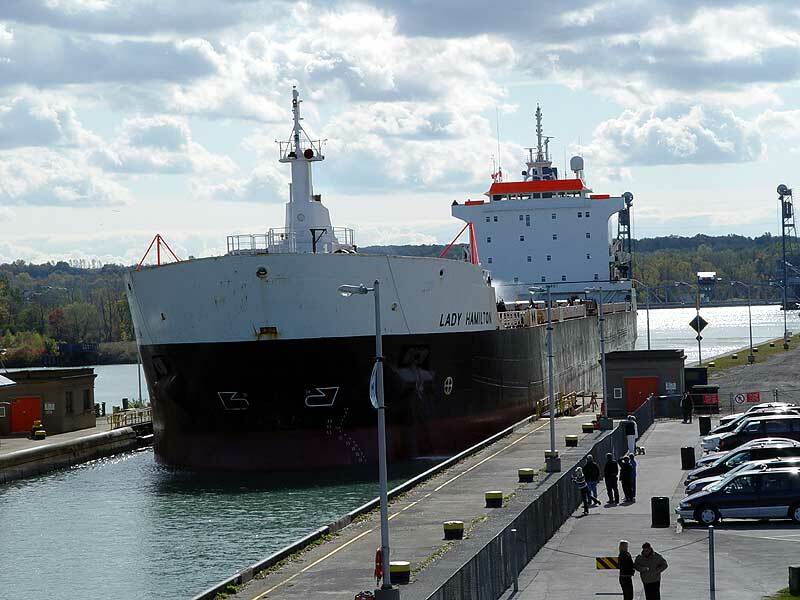 An unknown object was struck in the Seaway in November of that year, prompting a quick visit to Portship, Thunder Bay, ON. Inspection of stern area led to the replacement of a controllable pitch propeller blade with the ship’s spare. To close out the 1984 Great Lakes/Seaway season, she loaded cement at Clarkston, ON for Catskill, NY. On January 2, 1985 she arrived at Sydney, Nova Scotia to await orders. Eventually, she laid up for winter on January 27, 1985. Returning to the Great Lakes for the 1985 season, a notable trip on December 19, 1985, found both Selkirk Settler and "Sask Pi" loading petroleum coke simultaneously at Duluth, MN for delivery to Belgium. The pair traversed the Welland Canal in tandem, making for a historic photo opportunity. Following the 1986 Great Lakes season, on December 12, 1986 she loaded a cargo of grain for Limassol, Cyprus. 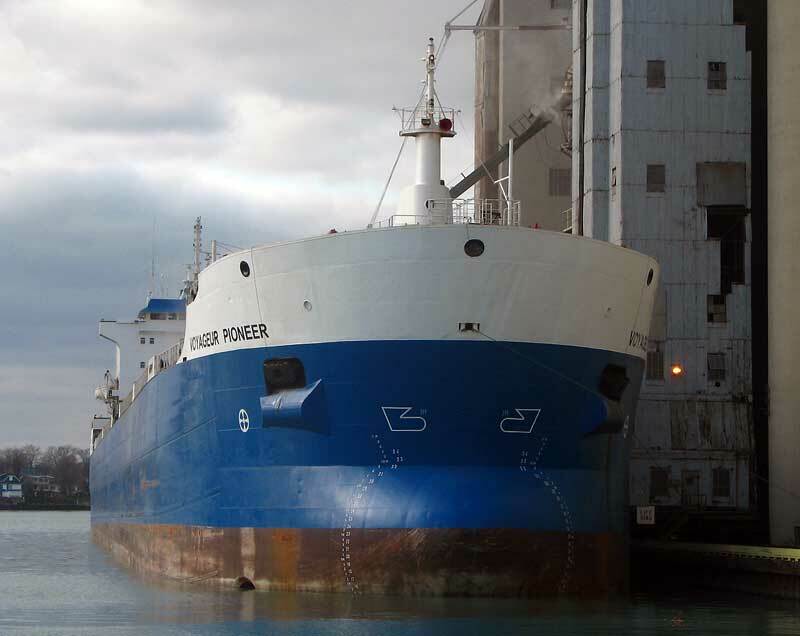 Completing her ocean trades, in spring 1987, Saskatchewan Pioneer opened the Great Lakes/Seaway Season at St. Lambert Lock, loaded with ore from Pointe Noire, QC for delivery to Burns Harbor, IN. On July 29, 1987 she visited Cleveland, OH with finished steel from Antwerp, Belgium. With declining tonnage in Canadian export grain during the mid to late 1980’s, and a shift of grain traffic through Canadian west coast ports, straight deck bulkers began to retire from the Canadian fleet. As a result, following the 1988 Great Lakes season, on January 26, 1989, Saskatchewan Pioneer’s Canadian flag registry was closed, changing to Castletown, Isle of Man. On December 23, 1989, the Saskatchewan Pioneer closed the 1989 Seaway shipping season, transiting downbound through the St. Lambert Lock. 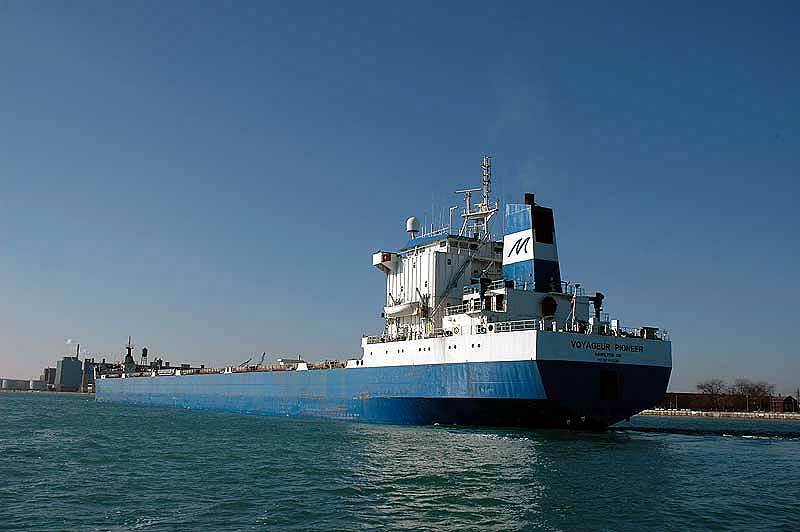 With continued consolidation of the Canadian bulker fleet, in 1991, Saskatchewan Pioneer joined the Great Lakes Bulk Carriers fleet, while her sisters, Selkirk Settler and Canada Marquis were sold by Misener to Fednav. Similar in design to Fednav’s Ocean/Lake fleet, these two vessels were a natural fit. Saskatchewan Pioneer made a rare trip to Cuba on July 9, 1992 where she loaded a cargo of sugar for delivery to Montreal and Toronto. In summer 1994, it was announced that Canada Steamship Lines acquired the Saskatchewan Pioneer, but she was to remain under charter to Fednav. 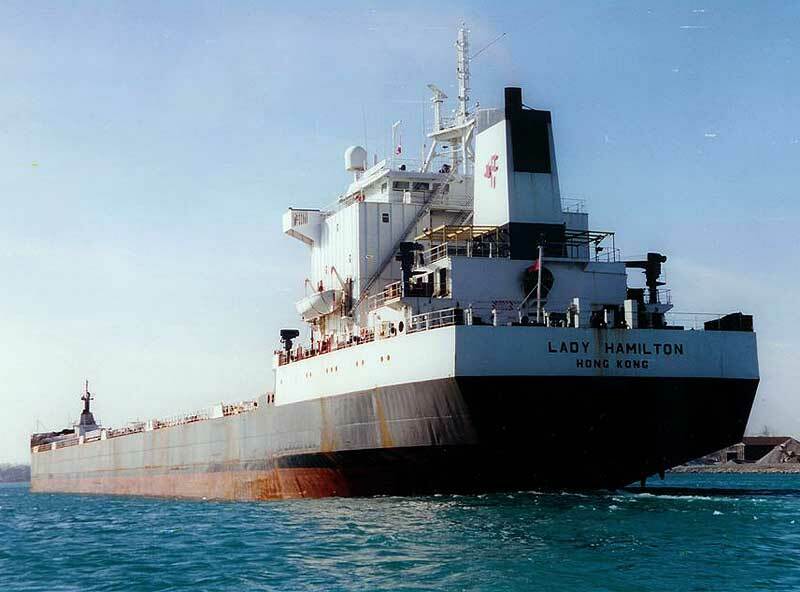 This was short-lived, as she was sold and renamed Lady Hamilton in Spring, 1996 and made her debut at the Welland Canal on June 2, 1996, enroute to Wharf 6, Thorold, Ontario with a part cargo of hard coal. While on the lakes, her funnel was painted into Fednav colors and her orange/yellow hull was repainted black. On September 17, 2001, a fire broke out on the Lady Hamilton. The ship was drifting roughly 12 nautical miles off Cloridorme in the Gaspe. Luckily, no serious injuries were reported, but the ship did suffer significant accommodations damage at the main and upper deck levels due to heat and smoke. 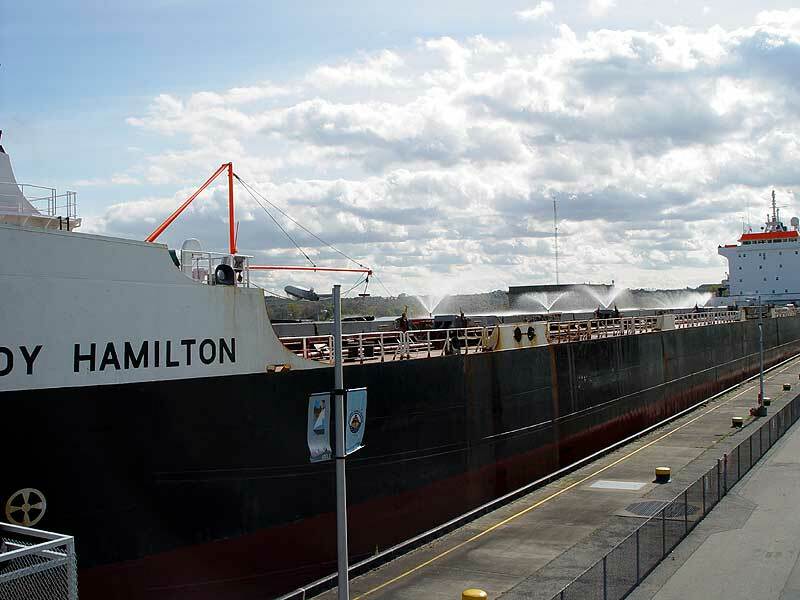 During 2002-2005, Lady Hamilton continued to sail under charter to Fednav, visiting Great Lakes ports 3-5 times per year with inbound steel. 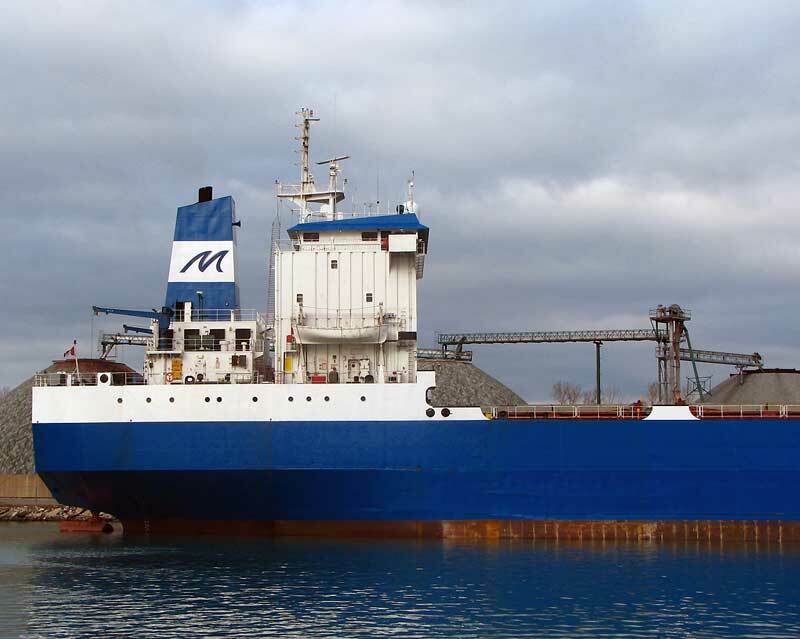 In fall 2006, Voyageur Marine Transport Ltd., Ridgeville, ON through an affiliate company Voyageur Pioneer Marine, Inc. purchased the Lady Hamilton and she sailed back to the Great Lakes in early November. Arriving in Hamilton, ON on November 1, she was given a quick refit, including a new bright blue hull and trim, and renamed Voyageur Pioneer, with “Pioneer” honoring her original owner’s name from 1983. On November 9, she sailed for Thunder Bay, ON to load her first cargo for her new owners, leaving November 12 with 24,098 tons (24,485.54 mt) of canola seeds loaded at Saskatchewan Wheat Pool 7B shifting to Agricore United “S” bound for Windsor, ON. Her trips for fall 2006 included 5 cargoes for Windsor, ON (4 w/canola seed, 1 w/soybeans), one to Baie Comeau, QC (soybeans) and one to Port Cartier, QC (canola seed). Her new owners state she is booked for all of 2007. With the continued retirement of straight-deck Canadian bulkers from the lakes, the addition of the Voyageur Pioneer is a welcome sight. 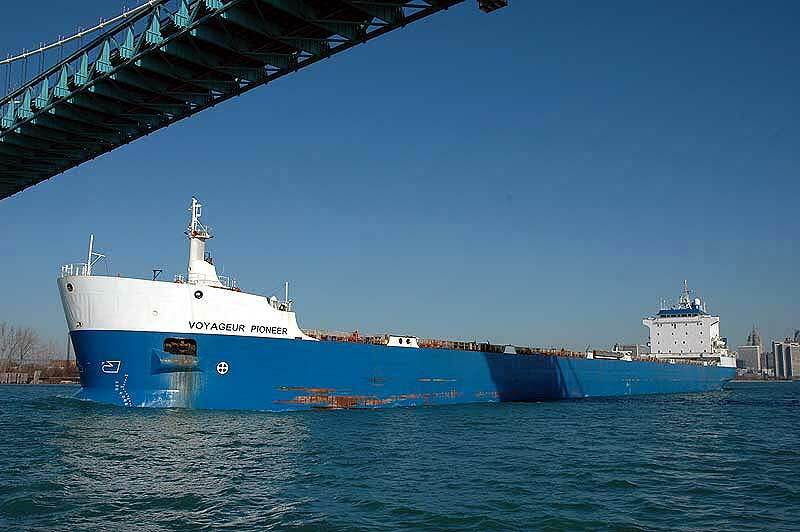 On Tuesday, August 28, 2007, Rand Logistics of New York, NY announced that its wholly owned subsidiary Lower Lakes Towing Ltd of Port Dover, ON acquired the Voyageur Pioneer and fleet mate Voyageur Independent for $25 million CAD from the Voyageur group of companies. 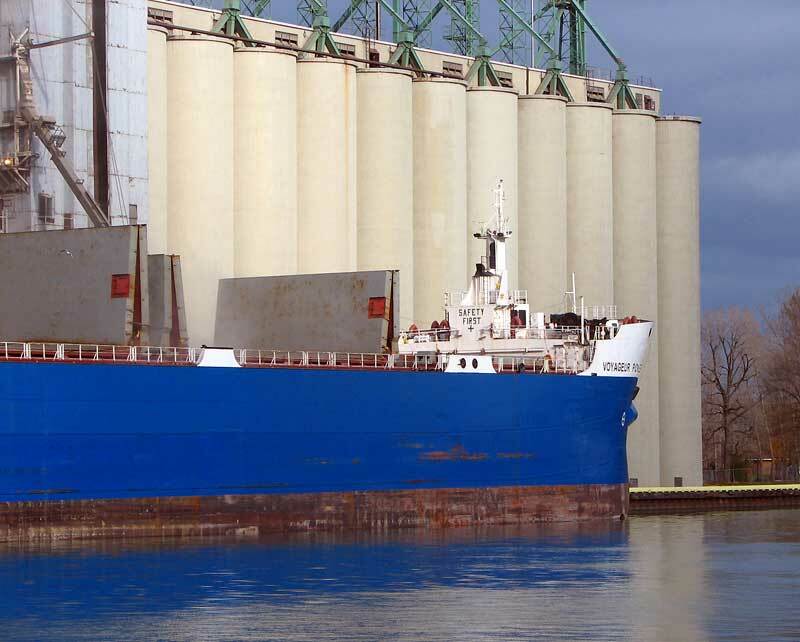 Under her new ownership, the Voyageur Pioneer would continue to service companies engaged in the grain trade as a result of Lower Lakes assuming or negotiating contracts with grain companies, thus allowing Lower Lakes to better utilize their self-unloaders in additional self-unloader business. On February 29, 2008, Lower Lakes registered the large bulker with Transport Canada under the new name Kaministiqua out of the port of Nanticoke, ON. After wintering at Sarnia, ON, the vessel left her lay-up berth March 16, 2008 for Sturgeon Bay, WI for dry-docking and painting. 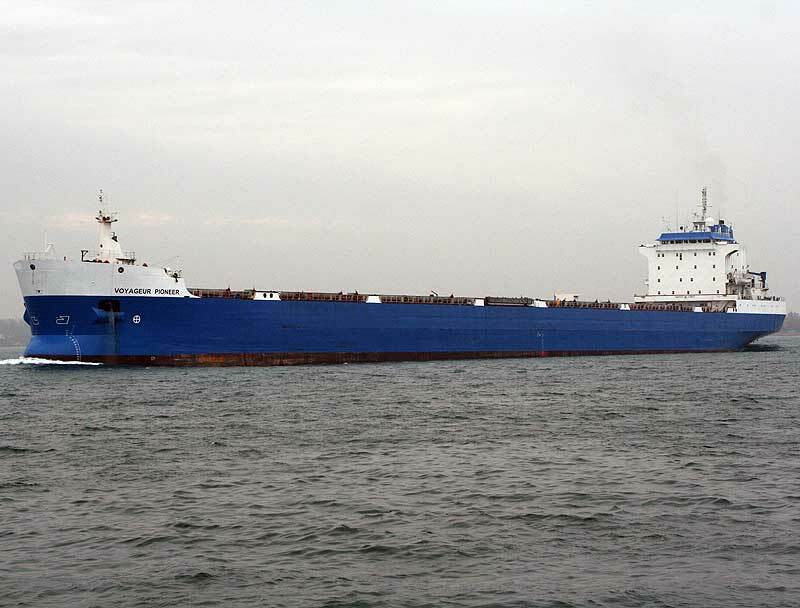 On April 24, 2008, the Kaministiqua arrived at Thunder Bay, ON from Sturgeon Bay, WI for her first load under her new name and colors, departing 2 days later with a 24,464 ton (24,857 mt) load of flax for Sorel, QC. Downbound the Welland Canal, Apr. 30, 2008. Stern view, St. Lawrence Seaway, May 2, 2008. At the Soo, Apr. 23, 2008. Stern view, Welland Canal, Apr. 30, 2008. Downbound, St. Lawrence River, Sept. 8, 2007. Welland Canal, Sept. 14, 2007. Night view at Sarnia, Oct. 10, 2007. St. Clair River, Apr. 10, 2007. Loading in Thunder Bay, ON, Nov. 12, 2006. Loading at Cargill, Sarnia Nov. 20, 2006. Bow view at Sarnia, Nov. 20, 2006. First trip to Thunder Bay with her new name, finishing loading at Agricore United, Nov. 12, 2006. At Cargill, Sarnia, Nov. 19, 2006. Downbound off Lake Huron, Aug. 29, 1986. Stern view passing under the Bluewater Bridge. Upbound the St. Clair River at Port Huron. As the Lady Hamilton approaching Lock 1 of the Welland Canal, Apr. 10, 2006. St. Clair River, Aug. 23, 2004. Entering Welland Canal's Lock 3, Oct. 17, 2003. In the lock, deck water sprayers going. Lower St. Clair River, Nov. 16, 2001. Close up, stern, Nov. 9, 2006. Stern view into Lake Huron, Nov. 9, 2006. Another view at Sarnia, Oct. 10, 2007. Leaving Welland Canal's Lock 4, Apr. 30, 2008. Copyright © Marine Historical Society of Detroit. All Rights Reserved.